Yes! 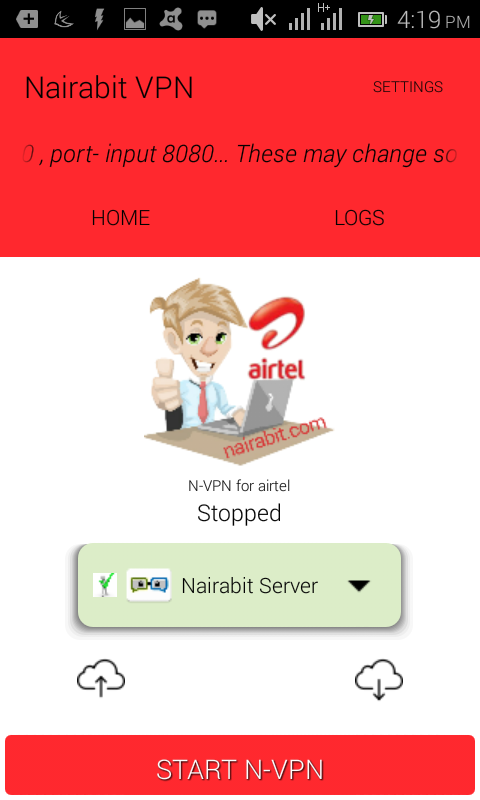 N-VPN for Airtel free browsing is out and blazing. 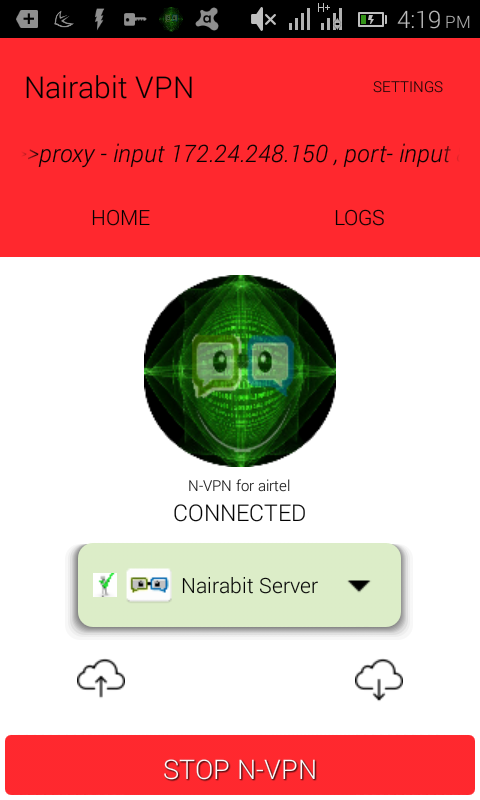 Onlike its predecessors "N-VPN for Glo" and "N-VPN for Etisalat", this one for airtel requires some minor settings but don't worry, its as easy as 123. So, why the settings? The major settings have been done and it comes preinstalled with the app, I realised i might come up with another proxy or IP, so you can change the IP anytime or day. The main aim of N-VPN is not only to provide free browsing but also to simplify the use of free browsing tweaks. Thanks to everyone that have waited patiently for this app to be released and after some testing, I can say its more stable and ready to be used. That's all !! !, amazing isn't it? Just go back and watch your N-VPN do its work. The green N-VPN logo will show when it has successfully connected. Just minimize the app and do what every you like on the internet. As for me, I'm watching live matches and other entertainment on Mobdro app. To connect N-VPN to your PC and brows unlimited, I have written a post on how to make this happen by using an application called PDaNet. Read the post now, and you are good to go. Enjoy this airtel unlimited free browsing while it lasts. Use the comment box below for any comment or issue. What does it mean? - It simply means you have not inputed the *IP and Port* as I have instructed in the post. 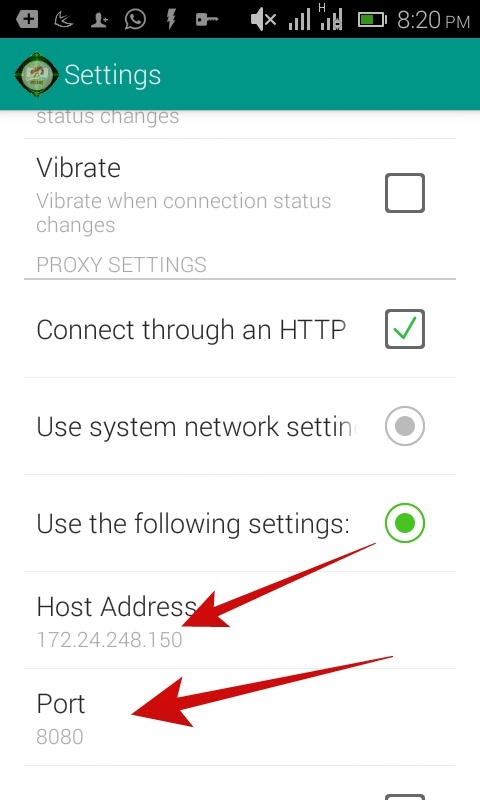 Scroll down to *Host address (you will see an IP address that I have already made visible), tap on it and input it. You are really doing an awesome job. The app is so user friendly and light. I love d app. 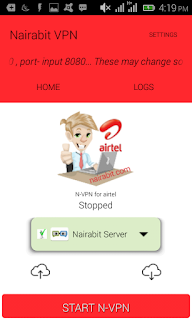 more grease to your elbow @NairabitCrew, I am now blazing with glo, airtel and Etisalat Nairabit apps, mtn to go now. #Gracia!!! Has airtel blocked it already? Na wa ooo...... Admin do something, Cu's I believe our free surf is ur paramount concern..... Airtel winches r @it again...!!!! Sorry I can't use it now as I have a working AirTel subscription. Or is there a way round it to preserve my data? Admin the tweak is horribly slow , can anything be done? 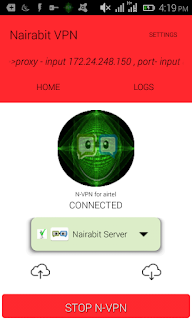 Nairabit VPN is the leading VPN in town....kudos to you bro. Bros any help for its slow speed ? I think it's doesn't connect again, I have tried it several times today but nothing, It keeps on saying " failed to connect to the network, HTTP proxy: recvfrom failed ETIMEDOUT (connection timed out) any useful help. Bro the tweak os no longer working oo. It doesn't connect again even with the settings. Please is there any new ip and host address that can be used? Hello admin, any free browsing cheat for android.